The 200 mile long Hurricane Cliffs mark the western edge of the Colorado Plateau, extend from the Grand Canyon in Arizona to some distance past Cedar City in Utah, and cross the northwest corner of Zion National Park where several branches of Taylor Creek cut into the layered rocks of red Navajo sandstone forming deep, narrow ravines, known as the finger canyons of the Kolob. 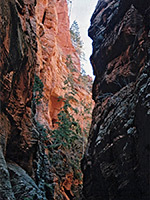 Other similar canyons are found at intervals to the north though away from the park they become gradually shallower and less sheer-walled, but the second beyond the NPS boundary is as good as any in the area - this is Spring Creek, which for about one mile runs through a beautiful high walled colorful canyon with intricate rock forms and textures typical of the Zion region. Spring Creek exits the Hurricane Cliffs 12 miles from Cedar City and 1 mile south of Kanarraville, Iron County. Just before the south edge of this town, a dirt track (signposted to the canyon) leaves the main road to the east, curves south and follows beneath the cliffs to the canyon mouth, a point identifiable from a distance by a neat V-shaped gap in the otherwise continuous straight cliffs. A rougher track heads up the valley aways, including several stream crossings, to the point where it narrows, but this route is for foot traffic only. The whole of Spring Creek Canyon is a Wilderness Study Area, and although closed to all mechanized vehicles, the track was constructed illegally in 1999 and continues to be used by ATVs. 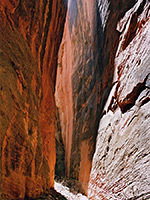 The canyon is a few miles outside Zion National Park, on BLM land, so no permit is necessary. 12 views of Spring Creek. TopoQuest topographic map of Spring Creek. Rocks at the lower end of Spring Creek Canyon are volcanic tufa, quite overgrown by trees, grasses and opuntia cacti. A small stream flows for most of the year and the environment seems to be full of life, with many lizards, birds and insects in evidence, abundant wildflowers in spring, plus the chance of seeing rare species such as bald eagles, peregrine falcons and mountain lions. 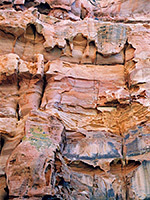 The track winds up the canyon for 1.5 miles, mostly on the southwest side of the streamway, while above the rocks change to sedimentary - several volcanic dikes and faults mark the changeover, initially to jagged, upturned strata then sheer, deep red Navajo sandstone around the end of the track where the narrows begin. By now the cliffs tower 750 feet above the valley floor, rising to a jumbled array of angled, eroded peaks. The stream fades away once the canyon proper starts, replaced by dry sand, stones and boulders, still with trees and bushes growing at the sides though other places have just bare rock. 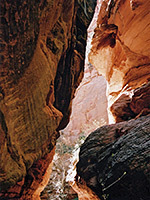 The canyon is never particularly narrow but has lengthy enclosed passageways, deep and quite shady, similar to the middle parts of Orderville Canyon. It twists and turns, sometimes by 90° and has only minor dryfalls and chokestones, so walking is always easy. 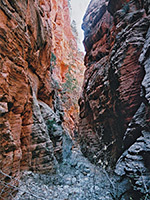 This section has various small side drainages, the last of which is reached after about 40 minutes hiking, then the canyon becomes straight, wider at the base and quite overgrown, with sandbanks at either side; the cliffs are now even more sheer and the streamway contains many boulders. It later splits into two branches (the northern fork is Sweetwater Gulch), each having a few narrow parts though both gain elevation quickly and remain quite overgrown. The hike to this point takes around 2 hours. The narrows of Spring Creek have plenty of footprints, and a clear path runs through the lower section so it seems to be quite well known. 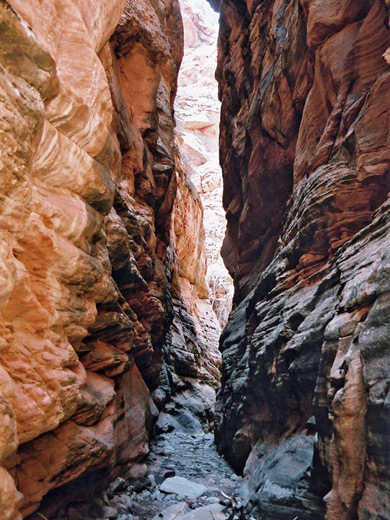 It offers a good half day hike, along a canyon which is deep, secluded and photogenic, just not especially narrow. The drainage is even prettier in fall owing to the colorful leaves of the trees that grow in some parts of the streamway.